BIG SALE!! JAPANESE ZEN GARDENS BIG SALE!! Mini square black wood Japanese Zen Garden includes a 3 1/2" Buddha figurine in brass finish, a frosted glass candle holder with tea light, white sand, polished river stones and a stone incense stick holder. Japanese Zen Gardens can be placed on a desk or table, they are a popular aid to meditation helping to clear the mind of stress and soothe the emotions. Long 9 1/2" L elegant black wood Japanese Zen style candle and incense holder includes a 3 1/2" H Buddha figurine in brass finish, a frosted glass candle holder with a scented tea light and a black stone incense stick holder with 2 incense sticks. Add the simplicity and beauty of Zen design to your decor. Long black wood Japanese Zen Garden includes a large reclining Buddha in antique brass finish, white sand, polished river stones, 2 faux stone candles and a matching rake to smooth out your stressful moments. Japanese Zen Gardens can be placed on a desk or table, they are a popular aid to meditation helping to clear the mind of stress and soothe the emotions. Make your Zen garden special, include real crystal and gem tumbled stones for just $2.95+. Each have their own Feng Shui properties and influence. 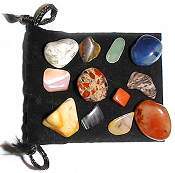 Velvet Pouch of 12 healing stones. 5 medium stones & 7 small stones from Brazil & South Africa. Typical stone mix can include Tiger Eye, Rose Quartz, Carnelian, Aventurine, Sodalite, Red Jasper, Pale Jade, Howlite, Leopard Skin Jasper, Moonstone and more. These are wonderful meditation stones. 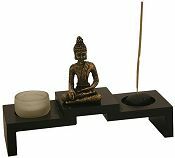 Sophisticated 10" L curved black wood Japanese Zen style candle and incense holder includes a 3 1/2" H Buddha figurine in brass finish, a frosted glass candle holder with a tea light and a black stone incense stick holder with 3 incense sticks. Arrange this sleek wood display base to your taste or add gem tumbled stones, small figurines or more candle holders. Add the sleek beauty of Zen design to your decor. Soothing antique faux stone round Japanese Zen Garden includes a serene white 3 1/2" H Buddha figurine, a white candle holder with scented tea light, white sand, polished river stones and a natural wood rake to smooth out your stressful moments. Zen Gardens are an aid to meditation, sand symbolizes the sea, stones are the mountains and the rake creates the endless patterns of life in the present moment which are beyond our understanding. 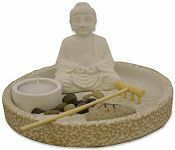 Elegant faux natural stone square Japanese Zen Garden includes a serene stone 4" H Buddha figurine, a stone finish 3" W lotus candle holder with tea light, white sand, polished river stones and a natural wood rake to smooth out your stressful moments. Zen Gardens are an aid to meditation, sand symbolizes the sea, stones are the mountains and the rake creates the endless patterns of life in the present moment which are beyond our understanding. Soothing antique faux stone square Japanese Zen Garden includes a serene white 4 1/4" H Buddha figurine, a matching stone finish candle holder with tea light, white sand, polished river stones and a natural wood rake to smooth out your stressful moments. Japanese Zen Gardens can be placed on a desk or table, they are a popular aid to meditation helping to clear the mind of stress and soothe the emotions. Large black wood Japanese Zen Garden includes a Buddha figurine and round pot in brass finish, white sand, polished river stones, 2 incense sticks and a matching rake to smooth out your stressful moments. Zen Gardens are an aid to meditation, sand symbolizes the sea, stones are the mountains and the rake creates the endless patterns of life in the present moment which are beyond our understanding. 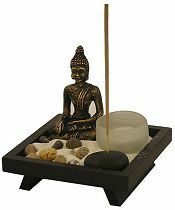 Long black wood Japanese Zen Garden includes a large Buddha and round pot in brass finish, white sand, 2 faux rock candles, polished river stones, 2 incense sticks and a matching rake to smooth out your stressful moments. Japanese Zen Gardens can be placed on a desk or table, they are a popular aid to meditation helping to clear the mind of stress and soothe the emotions. Beautiful black ceramic Hexagon Japanese Zen Garden includes a large Buddha in brass finish, white sand, polished river stones, a matching candle holder with tea light candle, 1 incense holder and stick and a wood rake to smooth out your stressful moments. Japanese Zen Gardens can be placed on a desk or table, they are a popular aid to meditation helping to clear the mind of stress and soothe the emotions. Long black wood Japanese Zen Garden includes a large Buddha, 2 lotus candle holders with tea light candles and round pot in brass finish, white sand, 2 incense sticks and a matching rake to smooth out your stressful moments. Japanese Zen Gardens can be placed on a desk or table, they are a popular aid to meditation helping to clear the mind of stress and soothe the emotions. Large 12" W square, teakwood finish wood Japanese Zen Garden includes a large glazed brown pot with 1 incense cone and 2 small incense sticks, a large bag of white sand, a mini flower pot, 5 large polished river stones, and 3 rake tools to smooth out your stressful moments. Place this Zen Garden on a desk or table and renew balance and simplicity in your life. Embark on an inner journey towards harmony as you create endless patterns in your garden's soft white sand. Brazilian AA Clear Quartz Crystal tumbled stones in even sized 3/4" W stones. Quartz magnifies Chi, the personal life force at the core of being and enhances its flow, nourishing the mind, emotions and physical body. 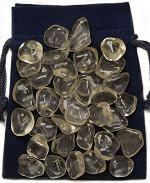 Actual 2 ozs or 1/8 lb of Clear Quartz stones shown on Navy Blue 3 1/2" x 2 3/4" Velvet Pouch.